On page 81 (history book for class VII), Akbar (who was an invader on the land of Bharat), is projected as being very friendly to the Rajput Kings. 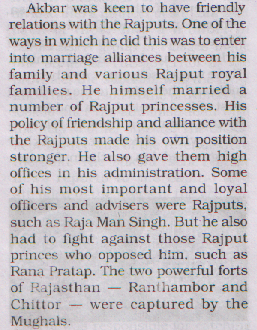 But he also had to fight against those Rajputs who opposed him, such as Rana Pratap. The chapter actually is titled Akbar. The chapter includes two full pages on the insignificant religion which Akbar floated, and which even his own progeny rejected. And this one line (actually part of a line) is the only reference to one of the greatest sons of Bharat, Maharana Pratap. 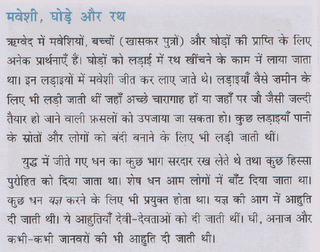 There is no other reference to Maharana Pratap Ji throughout the book! There is no reference of his famous horse. No reference of his 40kg spear. No reference of his life of tapasya which he led so that at least a part of the country remains free from invaders. 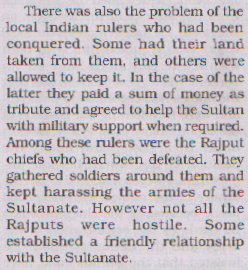 On page 33 (class VII history book), defeated Rajputs are said to be harassing the Sultan's armies. 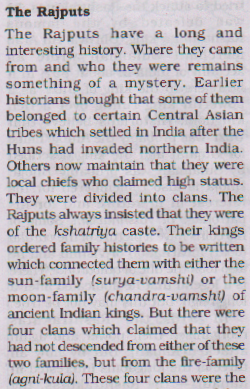 The book also says that not all Rajputs were hostile. This is the pattern throughout the book. The invaders are projected as the natural rulers of India, and the nationalist Indian kings are project as being hostile. 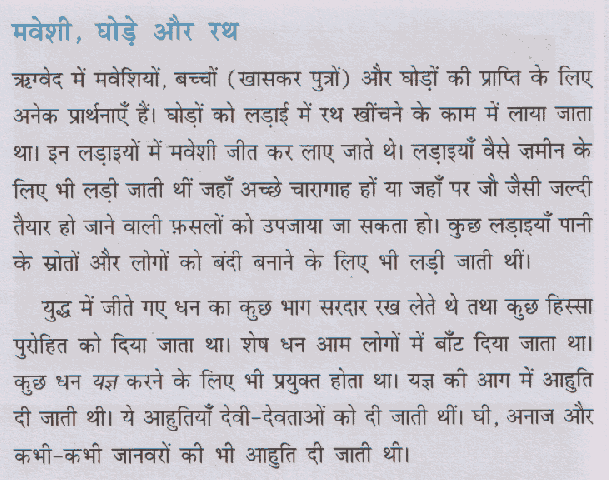 On page 28 (history book for class 7), NCERT says that the story of love of Radha and Krishna was very popular. 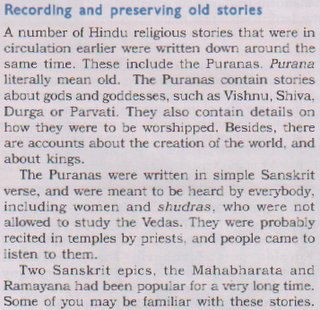 As shown in the quotes from the Class VI book, for NCERT Mahabharata and Ramayana are just stories. 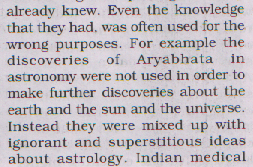 On page 27 (of history book for class 7), Indian Astrology is termed as ignorant and superstitios ideas. 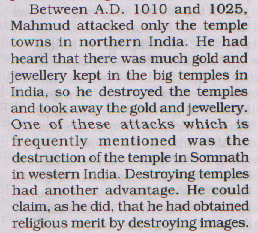 Destroying temples had another advantage. He could claim, as he did, that he had obtained religious merit by destroying images. 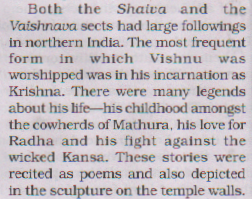 On page 17 in the history book for class 7, there is a small paragraph on His Lordship Adi Shankaracharya. the saint who is revered by all Hindus across the world, deserves any apithet. Same for Sri Ramanujacharya. In comparison the same book devotes two full pages on the insignificant religion floated for personal gains by Akbar the Great (sic). On page 118 of the book on history for class VI, NCERT quotes from a drama by Kalidas. And then the child is asked "Do you think that is a poor man finds something and reports this to the police he would be treated like this today?" Yes my child, all your great grandfathers were not only lunatic, they were corrupt too! What is the logic of quoting from a drama! Do the British historians quote from the "Arms and the Man" by Bernard Shaw to prove that all british armymen are flukes and cowards. 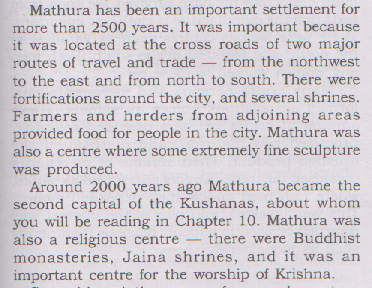 On page 93 in the book on history for class VI, the child is told that Mathura as a city is only 2500 years old, and that 2000 years back it was an important centre for worship of Krishna. 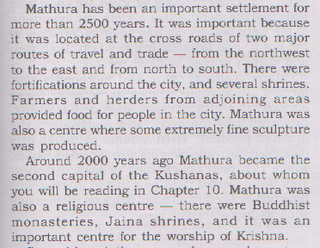 NCERT forgets to tell the child that Krishna was born in the same city more than 5200 years ago. Then on page 128 of the same book, the child is told that Ramayana and Mahabharata are just "old stories". And that these stories were written down around the same time, only 2000 years ago. Also note that NCERT will not miss a chance to proclaim "women and shudras were not allowed to study Vedas". Have we not found the submerged city of Dvarika? Have we not seen the images of the Ram-Setu taken via satellite? 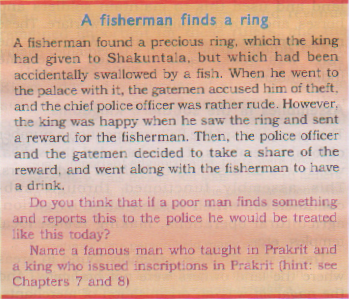 In a box on page 95, in the book on history for class VI, NCERT quotes from the Arthashastra. NCERT forgets to tell the child that the books get polluted over a period of time, especially when the country undergoes turmoil and slavery. As the women were being paid according to the "quality and quantity" of work, and they themselves were to visit the official (on completion of work which they do at their home), the last line, about the punishment on not completing the work, is obviously a later addition (pollution). Note that this is the only quote NCERT has made from the Arthashastra in the whole book. Also note the stire in the question that has been asked at the end of the quote. What effect is this going to have on the child? Will he not think that his ancestors were lunatics? We have seen how NCERT denigrates the Vedas and the sages in the Vedic era. 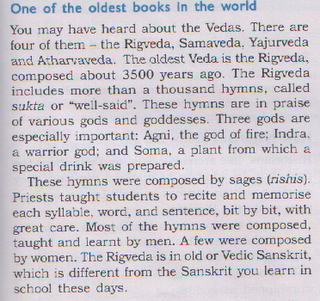 Now let us see how NCERT presents other religions to the class VI students. On page 109, the history book for class VI tells the child about Christianity. The child will obviously contrast these carefully selected quotes from the bible against those NCERT chose from the vedas. Also note that the child is not told that the Church considered women to be deprived of soul till the revolution happened as recently as only a couple of centuries ago! The NCERT also fails to tell the child that not a single verse in the Holy Bible is composed by a woman. Contrast this with the misplaced allegations which NCERT makes throughout the book against the Vedic Hindu religion. Then on page 120 of the same book, NCERT introduces Islam as a "religion of equality". It forgets to tell the child that women are forbidden from offering Namaaz and also that not a single verse in the Holy Quran has been written by a woman. On page 56, class VI children are told that the castes were affected only by birth. This is clearly not confirming to the numerous examples we have through out the Indian history where sons of shudras became sages or progeny of kings became vaishyas on growing up. That the Varnas are determined by Guna and Karma is also clearly indicated in the SriMadBhagvadGita. But according to NCERT, Varnas were determined by birth from the Vedic era itself. 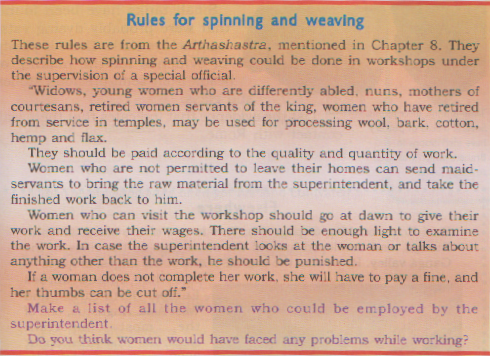 Also note the assertion that women and shudras were not allowed to learn the Vedas. 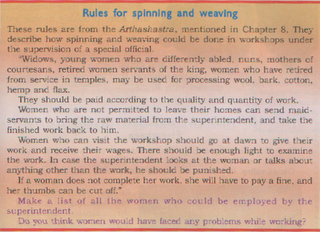 On page 72, while describing the ashramas, the assertion that women were not allowed to study the vedas is repeated. On page 43 of the book on history for class VI, the child is introduced to the Vedas. He is told that the Rig Veda was composed only 3500 years back. The child is told that there are three main gods -- Agni, Indra and Soma. This is factually incorrect. The plant Soma is not a god in the Rig Veda. Also Indra is not a warrior God -- he is the god of the environment. It is also specifically mentioned that the hymns were taught and learnt mostly by men with only a few exceptions. We will see later on how this bias is artificially imposed on the students -- as if women were discriminated against in the Ancient India. 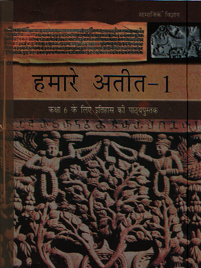 On page 46, the child is told that the Rig Veda has a set of prayers for obtaining cattle, children and horses. will obviously be left wondering if the great sages who composed the Rig Veda, were actually rogues. 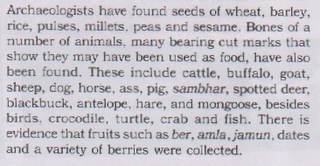 It is also wrongly mentioned that animal sacrifices were made during the yajnas. This is based on wrong vedic interpretations made by the western scholars. The child is left wondering why in the popular story of Ramayana, sage Vishwamitra asked for Lord Rama, to protect the yajna from being polluted by the Asuras -- who used to pollute the yajna by putting animal bones in the sacred fire. Well, what was the big deal if the sages were themselves sacrificing animals in the yajna fire? On the next page, the young impressions formed on the childs mind are confirmed. Were not the sages of Vedic era indeed rogues? He is told that the sages used to call themselves Aryas (civilized) and that the Aryas they used demeaning terms for their opponents -- calling them Dasyus. The child is told that as the time passed, the sages (or Aryas) started taking their opponents as slave. He is told that the women who were captured during the war were also taken as slaves -- and treated as the property (sic) of their owners! On page 50, the child learns that the sages in the Vedic era used to consume flesh of cattle, buffalo, goat etc. At home the child's father has been telling him that cow is holy. The child also knows how the first war of independence started with a revolt by the Hindu soldiers after the british started using cows flesh in the ammunition. Is it not possible that the few bones that were found were actually consumed by dogs, maybe by the Dasyus. Do we not find loads of Hindu literature condemning consumption of meat in general and Cows flesh in particular. Do not the Vedas themselves call the Cow Aghanya? 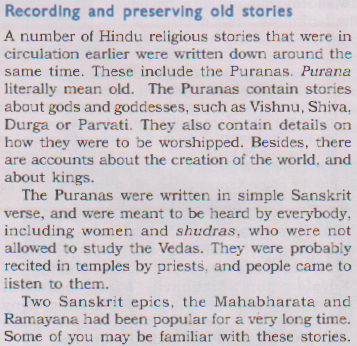 On page 8 of the book of history for class VI children we have a boxed explanation on the popular calendar system. The child is told that we adapted this calendar system 200 years back. What he is not told is the fact that the Vikrami Samvat is still the more popular calendar system followed in Bharat that is India. All the Indian Holidays and festivals follow the Vikrami Samvat. Also note that the way the information is presented in this box, the child will be left wondering if India had any calendar system at all before we started following the Christian calendar. 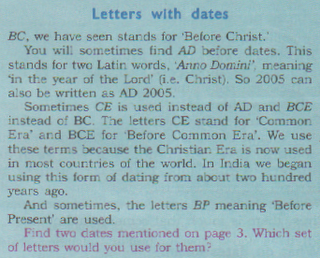 There is an obvious intention when NCERT skips the Hindu calendar. If the child is told that the current year is the year 5107 (yugabd), then obviously he is going to ask -- how come it is only 3500 years past the Rig Veda? 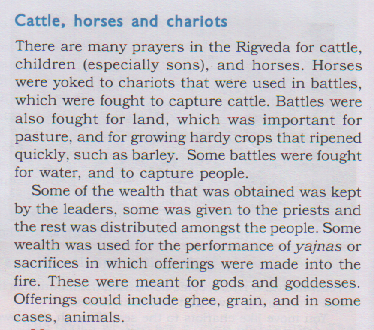 Page 4 of the history book for the class VI students. The book is named "Our Pasts" and has been introduced from year 2006. Here the class VI children are told how our country got its name Bharat. What is conveniently skipped is the popular belief that Bharat was named after a great king who was son of Dushyant and Shakuntala -- as described in the epic Mahabharata. NCERT catches them young. 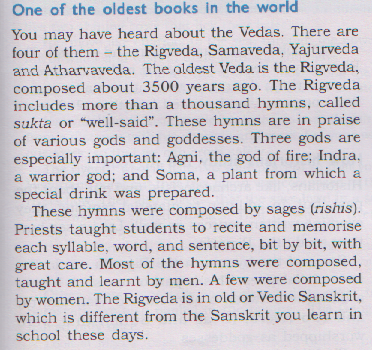 Children in class 6 learn how to interpret the Rig Veda! Demean Sri Ramakrishna to detoxify: "Yet see how a textbook for children officially produced by Arjun Singh’s HRD Ministry, through National Council for Educational Research and Training (NCERT), introduce Sri Ramakrishna to Indian children? It tells them that Sri Ramakrishna was ‘‘an illiterate and mentally unbalanced’’ person. Yes, Sri Ramakrishna is ‘illiterate’, ‘mentally unbalanced’! This book, written by Comrade Satish Deshpande is part of the new efforts to detoxify the students afflicted by saffronisation!"